Normally USB accessories don’t look so fashionable. I think these must be the coolest ones we’ve seen. 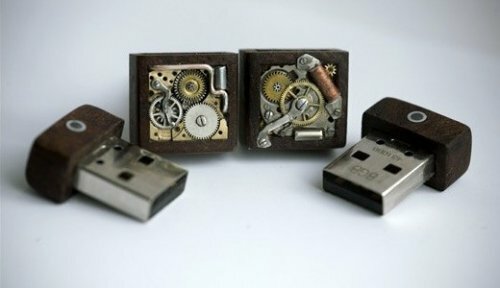 These handmade cuffs are just the right amount of steampunk and each features 8GB of storage. I would wear these in a second. However, like any other beautiful item, these are expensive. They will cost you $225. They are hand-carved and encased in walnut. Better start saving so you can wear these to your next big occasion. Getting an Etch-a-Sketch for Christmas is cool, but you would have to have been a super good boy or girl to get this one. Yes, this is an Etch-a-Sketch modified for the Victorian era. A time when you didn’t have ugly red plastic, but you did have brass and other cool metals. This one was indeed a Christmas gift, made by one talented young person as a gift for a friend. And he is obviously the best friend a guy could ever have. Great job. 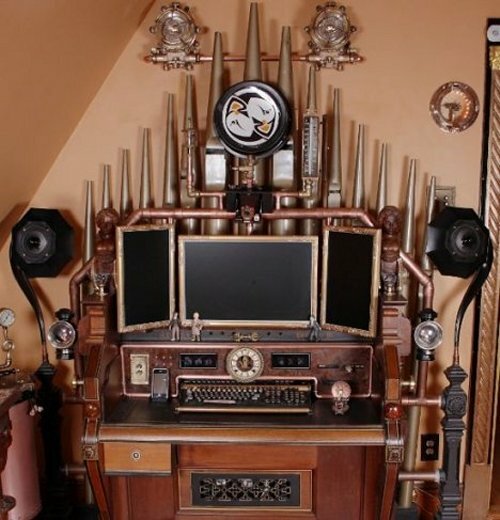 The Steampunk PC looks like it belongs in Doctor Who’s Tardis. Or on your great grandfather’s mantle. It looks like an old victorian clock on the outside but inside it is packing an Athlon 64 Dual Core 4400+ CPU, 160GB Hitachi SATA Hard Drive and 2GB of DDR2 / PC 800 RAM. The finish on the case is a nice dark one and it even comes complete with a skeleton clock. The Timekeeper will cost you $1099 and ships from the land of the rising sun. 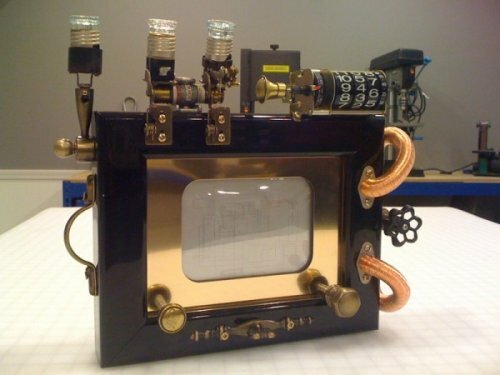 Check out this iPhone 4 dock, my Steampunk loving friends. 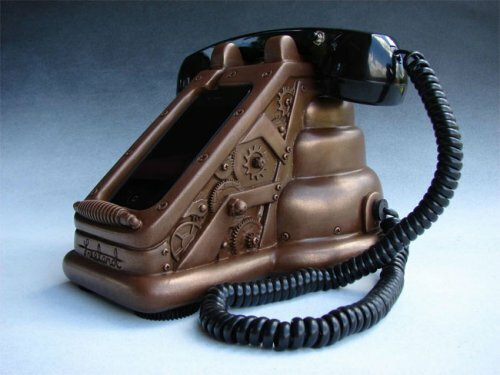 The iRetrofone Steampunk Copper iPhone 4 dock features a hand sculpted base by Artist Scott Freeland, cast from copper and polished by hand. It’s also signed by the artist. If you want one these iRetrofone Steampunk Copper iPhone 4 Docks, it won’t be cheap. They are available for $450 from Freeland Studios. 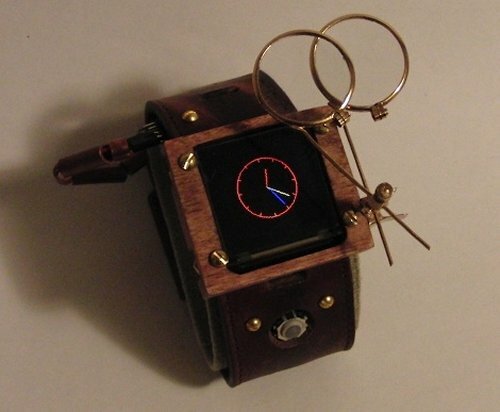 For that price at least it will match your other Steampunk gear. Too fake looking for my taste, but I’m not a big Steampunk enthusiast. Another day, another Arduino-based gadget. But this one is actually something you will want to wear. The Arduino Watch: Steampunk Edition has temperature, range finding, and trackball input while displaying time, games, and more with its 128 by 128 pixel OLED 16 bit display. It plays Breakout and has the ability to display time in digital, analog or binary. Other sensors and programs can be added if you like. It can be made for around $250. I took my kids down to a car show that they have at a local restaurant each moth last night. I had to explain the finer points of what a ratrod was to my kids. All they saw was a car with a flat paint job and visible damage. 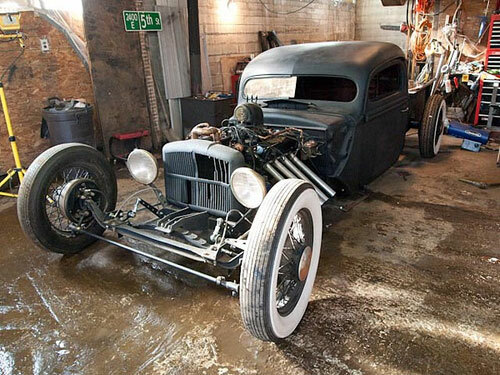 A ratrod isn’t supposed to look perfect, the car is supposed to have character and look like it has been somewhere and used a lot. I ran across a sweet ratrod that has lots of steampunk elements and it is cool. We’ve seen our share of Steampunk items, but few are as large as this Victorian Organ Command Desk. It took the creator about 6 months to complete, and it sure looks worth it, as there is a ton of detail. It looks like a full organ behind it all. The whole setup offers 3 monitors, a printer, scanner, webcam, horn speakers, iPhone dock, card readers and a built-in clock. H.G. Wells and Jules Verne would love to sit there and write. 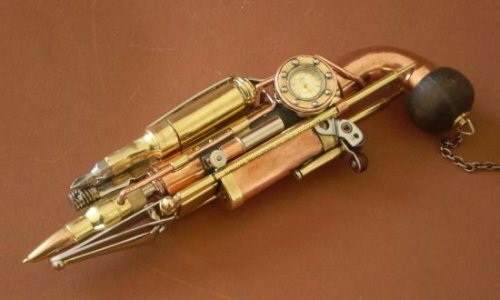 Looking for some multi-function in your Steampunk gun? Then this one is for you? It’s basically a Steampunk Swiss-Army Knife. This steampunk metapen gun is almost as small as the world’s smallest gun as well. It’s made from all the usual materials, brass ,copper, wood and steel. And it does more than just shoot Victorian-clad villains dead. There’s a fork, knife, spoon, lighter, USB drive, watch, lamp, screwdriver, pipe, toothbrush, sawing blade, nail clipper and two extra mines. Pretty awesome. Had Luke worn this helmet when rescuing Princess Leia she would have said, “Aren’t you a little Steampunk to be a Stormtrooper?” It would have been a whole different movie had the Stormtroopers looked like this. 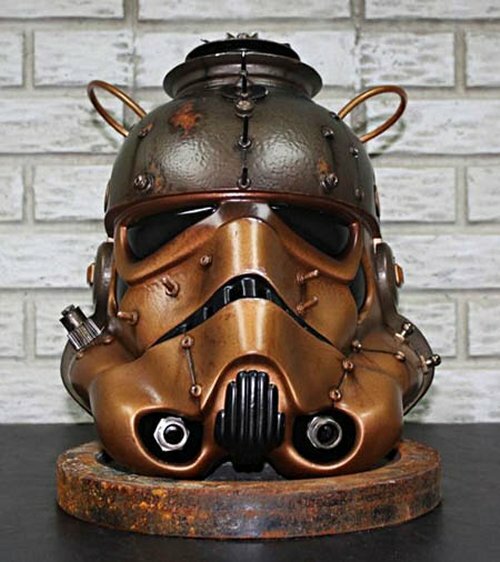 This Steampunk Stormtrooper Helmet is just plain awesome and menacing in a whole different way from the usual sterile white. That top area makes it look as if the Empire has been swapping some brains between troopers too. I like Steampunk stuff mostly because the things look cool and I can appreciate how long it would take to build some of these designs. That said you would never find steampunk gear in my house. I like my tech to look like tech, not something I might find in grandma’s attic. 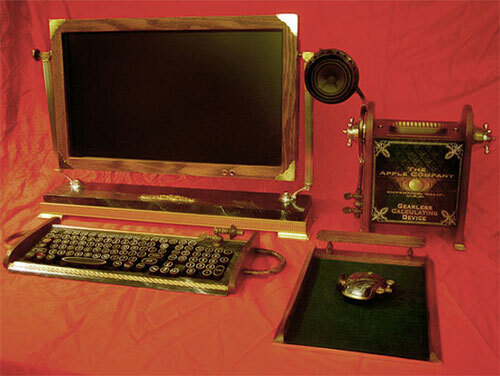 A new steampunk computer with some serious attention to detail has turned up over on Yanko Design. The thing is the complete deal with a cool looking tower thingy that might be a speaker, a keyboard, mouse pad, mouse, and a display. The keyboard is my favorite part. We’ve seen our share of steampunk devices around here, but we’ve never seen a steampunk Harley Davidson. Until now. The bike frame looks like a Steampunk skeletal structure more than a frame. There’s also a cool T-Sable Spring engine and of course a Harley-Davidson transmission. It goes by the name “Barro”. 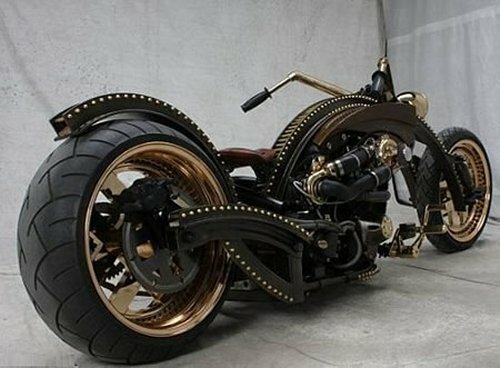 I would call it a sort of minimal interpretation of steampunk, but it works and makes the bike look as if it’s alive. Musician Yoshi Akai is an unorthodox musician. He dreams up ways to turn color into sound, and other unusual ways of producing music. 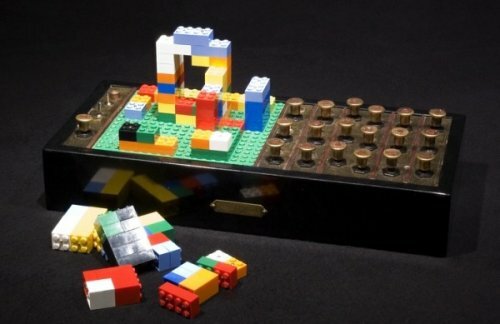 Like this Lego Sequencer MR II, which uses three-dimensional Lego structures to emulate a three-channel, eight-step sequencer. Each differently colored plastic brick produces a different sound and complex combinations (including tremolo and overdrive) are possible when the blocks are stacked. It works using resistors in every block, with parallel networks of resistors formed as the bricks pile up, equalling lower resistance, which means a higher frequency sound is generated. We’ve covered many steampunk mods around these parts. Some are actually Steampunk while others are just a lot of brass attachments glued onto a gadget. Well this one is Steampunk alright. And these guns actually fire. The blunderbuss shown above shoots not bullets, but rubber balls. That doesn’t mean it won’t hurt like a real bullet though. It shoots those rubber balls fast enough to actually penetrate cardboard from a distance. Ouch! And while we don’t want to be on the wrong end of this thing, we can’t help admiring the craftsmanship. Check out some videos below. This just may be the most awesome Gameboy mod ever. 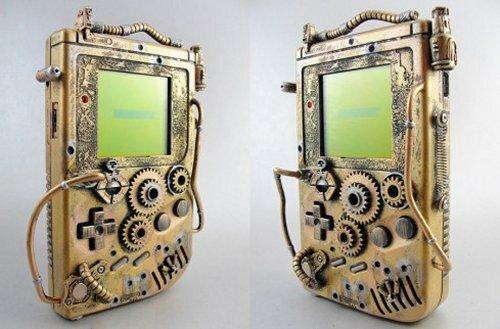 The steampunk Game Boy. The ultimate in Victorian handheld gaming. Sure it looks awesome, but the modder also added a pro sound mod which increases the the output and changed the red LED light for an orange one. It took only a week to complete the project, even though it looks like it took much longer. Awesome job. It looks like it was dug up from an archeological site. 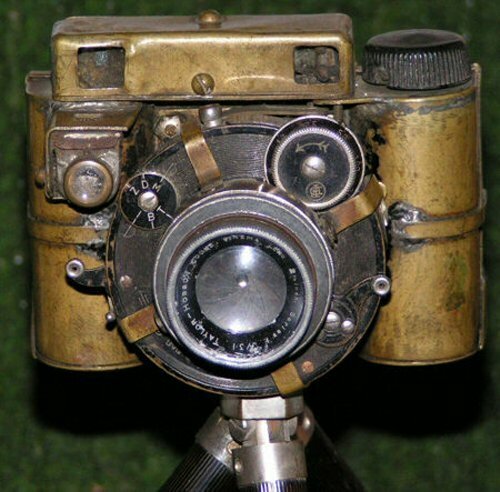 When the big name camera makers don’t offer any Steampunk cameras, what do you do? You build your own of course. That’s what this guy did. He built himself a homemade steampunk camera. And it’s more than just a digital camera with a brass case on it. It’s completely homemade. Which is very impressive indeed. Aside from one obviously plastic piece. It must come in handy for snapping photos of all your handlebar-mustached relatives.